After Carli Lloyd scored her second goal in the first five minutes of Sunday's World Cup final, so many people were going to her official website that it crashed. Everything else associated with Lloyd was on the rise. While on the field during Sunday's 5-2 Cup-winning triumph, Lloyd, who added a third goal in the 16th minute to complete a hat trick, picked up roughly 50,000 Twitter followers. One autographed card of Lloyd that closed on eBay during the game sold for $177.50. Another that closed after the game sold for $218. Before the World Cup started, Lloyd autographed cards could be had for $15 to $20. Thuzio, which links athletes with clients for public appearances, estimated that the cost to ink Lloyd for a two-hour appearance would cost approximately $30,000, up from $10,000 after the U.S. won its quarterfinal match and up $15,000 after the team beat Germany in the semifinals. That's compared to current rates of $7,500 for 1999 World Cup player Brandi Chastain and the estimated $25,000 for "Miracle on Ice" hero Mike Eruzione gets. While Nike has recently used Lloyd frequently in its Training Club marketing, the winner of the Golden Ball -- given to the best player in the World Cup -- doesn't have many other marketing deals. Lloyd signed a deal last September with Usana Health Sciences, which has used her in some company public relations. Last week, her agent, Josh Weil, closed a deal for her to represent Visa through the 2016 Olympics. 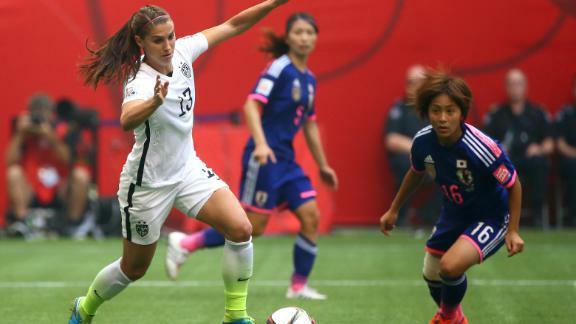 "A lot of what we were going to do was going to be predicated on how the World Cup went," Weil told ESPN.com. "So we're in pretty good shape now." Weil said he is in advanced talks with an auto company as well as a watch company that has never before done anything with soccer. "I would like to see some deals come through with top USOC or IOC sponsors ahead of the Olympics: Bridgestone, AT&T, McDonald's -- those types of companies," Weil said. Lloyd has particularly charged Weil with looking for creative deals in the training and nutritional space. "She's all about her training and what she puts in her body, so anything in that area, including food, health and wellness, is what she is always focused on," Weil said. Despite her World Cup performance, Lloyd has a long way to catch up to Alex Morgan, who has at least 10 endorsements with companies. Sunil Gulati, president of the U.S. Soccer Federation, said Morgan will make at least $3 million this year. Lloyd plays her professional soccer for the Dash in Houston, which is home to the second-most Fortune 500 companies behind only New York. Julie Foudy of espnW and ESPN FC's Julie Markgraf discuss how Team USA stepped out of the shadows of the 1999 team by winning the 2015 Women's World Cup.